Koala's are renowned for being that cute cuddly things from trees. A distinctive part of marsupials and Australia. Of course they can also be pretty vicious, and you've got to be pretty good to see one in the wild. They've got sharp claws, and particularly strong legs and arms to climb trees at a good clip. They're one of those beasts, that like the goanna, when threatened on the ground, that will run for the nearest thing that goes up. And if you're there and the closest thing they'll leave you well scratched and clawed up. Anyway, here's a pretty good love story from the Sydney Morning Herald. Last week CFA firefighter, Dave Tree, found an injured koala. 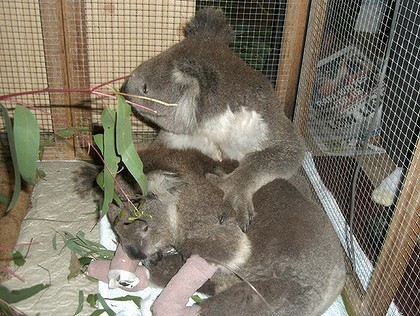 'Sam' accepted a bottle of water and is now recovering at a wildlife centre. A love story between two badly burned koalas has provided some heart-warming relief after days of devastation and the loss of over 180 lives in Victoria's bush fires. The story of Sam and her new boyfriend Bob emerged after volunteer firefighter Dave Tree used a mobile phone to film the rescue of the bewildered female found cowering in a burned out forest at Mirboo North, 150 kilometres south-east of Melbourne. Photos and a video of Mr Tree, 44, approaching Sam while talking gently to her, and feeding her water from a plastic bottle as she put her burned claw in his cold, wet hand quickly hit video sharing website YouTube, making her an Internet sensation. But it was after reaching a wildlife shelter that Sam met and befriended Bob, who was saved by wildlife workers on Friday, two days before Sam, in Boolarra, about 180km from Melbourne. Mr Tree, who has been a volunteer firefighter for 26 years, said it was extremely rare to get so close to a koala so he asked his colleague Brayden Groen, 20, to film him. "You can how she stops and moves forward and looks at me. It was like a look saying: 'I can't run, I'm weak and sore, put me out of my misery,' " Mr Tree said. Ms Wood said about 20 koalas had been brought into her shelter in recent days, several of whom had bonded as koalas are known to clump together, but none had garnered the same attention as the new internet star Sam. Mr Tree, a volunteer with the Country Fire Authority Victoria, has visited Sam since her rescue and was delighted to see she had found a boyfriend in Bob.